Instead of hosting our own fall Community Day in Victory Park as we've done in the past, this year Daybreak Community Church decided to join in Royersford's 2nd Annual Community Day on September 8, 10am-3pm. 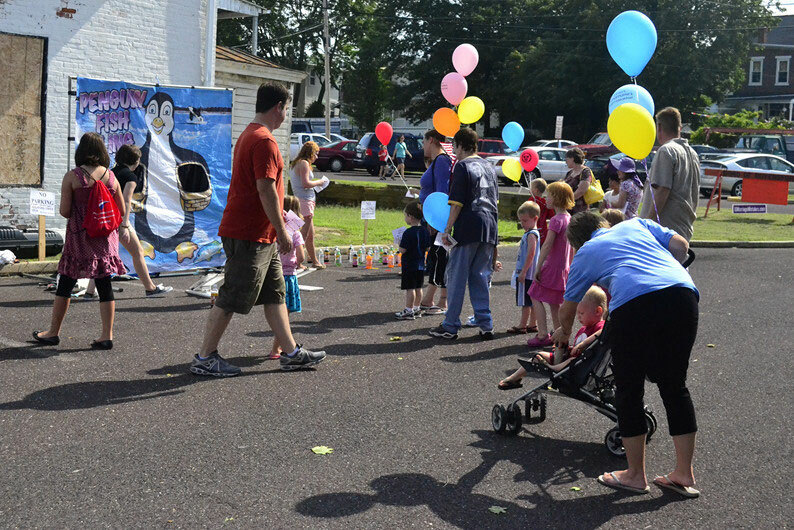 This event was organized by the Royersford Business Association and involved games, music, classic cars, food, and information booths for local merchants, government, non-profits and churches. Main Street was shut down to vehicle traffic between 3rd & 5th Avenues to stage the event. Daybreak sponsored the MoonBounce, arcade games and prizes for the kids, with Daybreak families helping out to run the games and staff the information booth. THANKS SO MUCH to our Daybreak volunteers! Some were there for hours and hardly took a break. And we also had help from local youth-- many thanks to Annamarie Chestnut of Annamarie's Place for rounding up some willing hands. We saw some big smiles from the kids and they just didn't want to quit even with the rainclouds in sight! At our information booth we handed out some information packets, candy and balloons and greeted our Royersford neighbors personally. We we so glad to meet some new folks!